A recording act that's been around a while eventually presents a holiday album. Take 6, the a cappella jazz group whose roots lie on the campus of Oakwood College in Huntsville, Ala., brings The Most Wonderful Time of the Year. Claude V. McKnight III formed a group known as Gentlemen's Estate Quartet, which was later joined by Mark Kibble. After a few lineup and name changes, the group became Take 6 in 1987. The group has earned several Grammy awards and has collaborated with a number of other artists, including the Yellowjackets, Stevie Wonder and Don Henley. "It's the Most Wonderful Time of the Year" has a delightful, swinging groove. Using a combination of finger snaps and wordless vocals, the group sounds like a band more than an a cappella ensemble. The vocal harmony is superb. McKnight and Chea run point on "You're a Mean One, Mr. Grinch," injecting a conversational dialogue to introduce the piece. Chea's bass lead does honor to the original recording by Thurl Ravenscroft, while Chea rolls his R's with emphasis. The background vocals responds to the lead, adding a humorous element, particularly on the "stink, stank, stunk" phrase. The finger-snapping "The Sugarplum Dance" is a clever take on the Tchaikovsky classic, the wordless chant retaining the song's mystique. Although the voices engage mostly in doo-wop style, there are phrases where one member takes on the role of a muted trumpet. 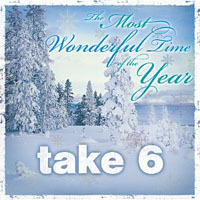 Take 6 keeps the melodies simple, so that these Christmas favorites are easily recognizable and revered. But the group also puts its personal stamp on each song. For those wanting something other than typical Christmas album fare, "Mr. Grinch" and "I Saw Three Ships" help set this collection apart from others. Track Listing: It's the Most Wonderful Time of the Year; White Christmas; Grinch Introduction / The Grinch / You're a Mean One, Mr. Grinch; Sleigh Ride; I'll Be Home for Christmas; It Came Upon a Midnight Clear; The Sugarplum Dance (Dance of the Sugarplum Fairy); I Saw Three Ships; Jingle Bells; Christmas Time Is Here. Personnel: Claude V. McKnight III: vocals; Mark Kibble: vocals; Joel Kibble: vocals; David Thomas: vocals; Cedric Dent: vocals; Alvin Chea: vocals; Shelea Frazier: piano (10), vocal (10).